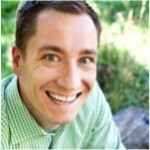 Thursday is guest post day here at Duct Tape Marketing and today’s guest is from DJ Waldow – Enjoy! You can have the best offer, the most compelling copy, sent from a trusted source, using a subject line that has been optimized for your audience … and yet, if you don’t have a list of email addresses to send to, none of it matters. Without a list of email addresses in your database, email marketing can be quite challenging. That is why email list growth is the single most important aspect of any sustainable email marketing program. And it’s not enough to just focus on growing your email list as a one-time task. It’s imperative that list growth be ongoing. Why? Simple. Your email list shrinks by an average of 30% every year. This churn rate, as it’s called, is comprised of subscribers who unsubscribe, mark your email as spam, change employers (and therefore email addresses), and so on. On top of the 30% churn rate, there is a portion of your list – in many cases a significant portion – who are unemotionally subscribed. This is the group of subscribers who simply ignore your emails. They don’t mark them as spam. They don’t opt-out. They want to receive your content, but just don’t want it (or have the time to read it) right now. So with your email list constantly shrinking, you can see why it’s critical to focus on ways to constantly grow your list. Most of us are familiar with the “traditional” list growth tactics – adding an opt-in to your homepage, asking for an email address on checkout or before someone can download a whitepaper or register for a webinar, and so on. Below are 3 creative tactics to grow your email list. 1. SmartPhone App: Smartphone usage across the globe has now topped one billion. Based on that number, one that continues to rise, it seems quite logical to leverage mobile devices – and specifically apps – to grow your email list. I’ve seen this done a few ways recently. BabyCenter, an online resource for new and expectant parents, provides personalized, expert advice based on the age of your child. In addition to the content published on its site, BabyCenter also sends out weekly email newsletters to all subscribers. As you can imagine, they take email marketing pretty seriously. 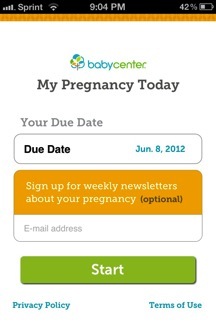 When my wife was pregnant with our second child, I downloaded BabyCenter’s free “My Pregnancy Today” app. After entering in my wife’s due date, I was presented with the opportunity to opt-in to for weekly email newsletters about my (well, my wife’s) pregnancy. What I really love about this approach is that BabyCenter makes it very easy to opt-in (“only email address is required”) and they share what I’ll receive in return (“weekly newsletters about your pregnancy”). Our son, Cal, was born on June 1st of this year. My wife and I are still subscribed to BabyCenter’s weekly email newsletter – and we read every single one! 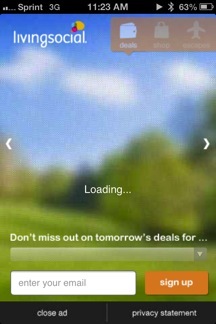 Another company who is using smartphone apps to grow its list is Living Social. This example below shows what appeared on my iPhone while waiting for one of my Pandora stations to load. The messaging from Living Social says to opt-in to its daily email so as not to miss out on “tomorrow’s deals.” Similar to BabyCenter, the opt-in was clear, obvious, and quite simple – only email address was required! 2. QR Code: While adoption rates for QR codes are relatively slow – 9% of US adults have used a QR code in the past year according to a June 2012 eMarketer report – I still believe it is a list growth tactic worth testing. However, if you are planning on using a QR code to drive folks to an email opt-in page, I suggest getting a bit creative. That’s exactly what Blowfish Sushi in San Francisco did when it put this poster (below) on the door of the Men’s bathroom! Yes. 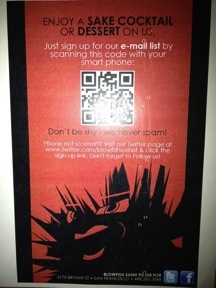 Your read that correctly – a QR code on a bathroom door! I snapped this picture on my way into the Men’s room one evening. 3. SMS: If you are someone who does a lot of presentations – both online (webinars) and in person – using an SMS short code can be an effective way to grow your email list. In November, I contacted my friend Justin Mastrengelo who owns JA.TXT – an SMS marketing software application. He set me up with a SMS short code that I started using to opt folks into my email list. It’s quite simple. The first step is to text a keyword to a 5-digit number. 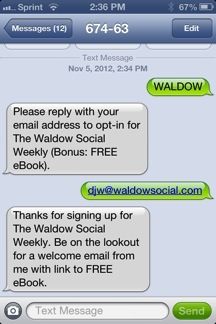 For my email opt-in, that means texting “WALDOW” (no quotes) to 67463. Then, as can be seen above, I automatically send a text back asking to reply with an email address. I also mention the “Bonus.” Once the person replies with a valid email address, I send one final SMS – a thank you. The next step is the key – and one that I see missed too often. I integrated this process with my email service provider (Infusionsoft – the same provider used by Duct Tape Marketing) – such that an automatic thank you / welcome email is sent as soon as someone opts in. Does it work? It has been very effective so far – for me. In the month of November, 30% of my total list growth came from this SMS option. To be clear, I also presented at two live events and gave one webinar in November. So it’s important that you have opportunities – and a captive audience – in order to use the SMS tactic. However, just because a certain list growth tactic works for one marketer does not mean it will work for you. As I advise all clients, it’s critical that you test what works best for your audience. Have you tried one of the three creative list growth tactics above? If so, how effective were they? What other methods are you using to grow your email list? Please share in the comments below! DJ Waldow is an email marketing consultant, writer, blogger, speaker, and co-author of The Rebel’s Guide to Email Marketing. He is the founder and CEO of Waldow Social, a company that helps clients take their email marketing programs to the next level. DJ has spent nearly 8 years in the email, social, and community-building world, advising clients on how to optimize their email marketing campaigns. DJ can be found on most social networks under the handle “djwaldow” or by searching “DJ Waldow.”DJ is an alumnus of the University of Michigan and a lover of beer, coffee & people.